This is a modern depiction of the ancestral explorer, Toi, here called by one of his many names Toitehuatahi (Toi the only child). 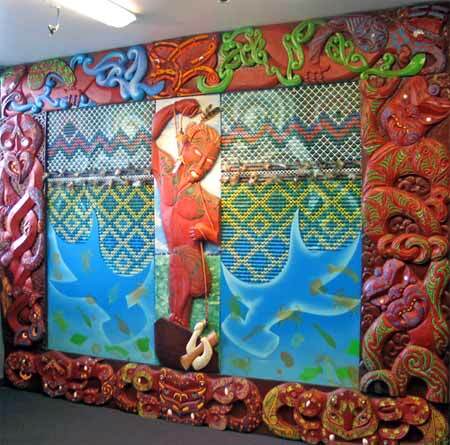 In this carving by students of Te Whare Wānanga o Awanuiārangi, a tertiary institution at Whakatāne, he is shown fishing up a degree certificate. Toi is acknowledged as the principal ancestor of many North Island tribes, including Ngāti Awa. However in Ngāti Awa tradition Toi is not an early arrival but lands 12 generations after Tīwakawaka, the first Ngāti Awa explorer to settle the land around Kākahoroa (Whakatāne).